Zombading: Patayin sa Syokot si Remington! A boy is given a curse for treating homosexuals badly. Years later, the curse manifests on the young man as a demon attacks him at night. Every morning, he finds himself slowly turning gay. 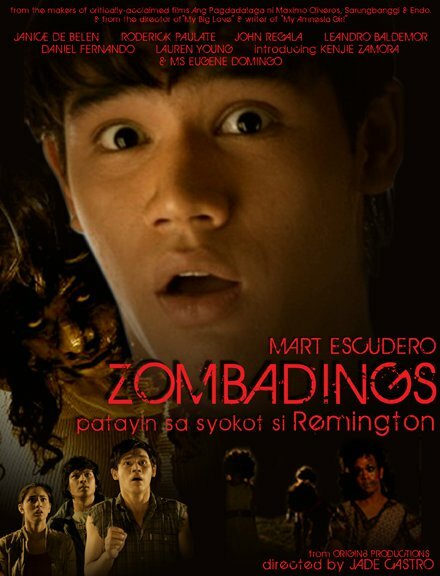 Zombading 1: Patayin sa Syokot si Remington! Zombading: Patayin sa Syokot si Remington! stars Mart Escudero, joined in the cast by Angelina Kanapi, Daniel Fernando, Eugene Domingo, Janice de Belen, John Regala, Kerbie Zamora, Lauren Young, Leandro Baldemor, Roderick Paulate. Under the direction of Jade Castro. It is very much recommended , you will forget all your problems and will surely laugh from beginning up to the end of the movie! Now Showing Nationwide!